UPDATE, Jan. 9 — In an interview with ABC news, DiBlasio discusses the ethics of sharing a source’s information with a third party: in this case, the source’s mother. Hundreds of news outlets today are reporting the story about USA Today reporter Natalie DiBlasio, the 2011 Vermont Cynic editor in chief, whose outreach to a reader helped a woman find her missing son. The story—which started circulating around social media a day before becoming official, widespread, old-media news—started with DiBlasio’s USA Today article about recent frigid temperatures gripping the country. 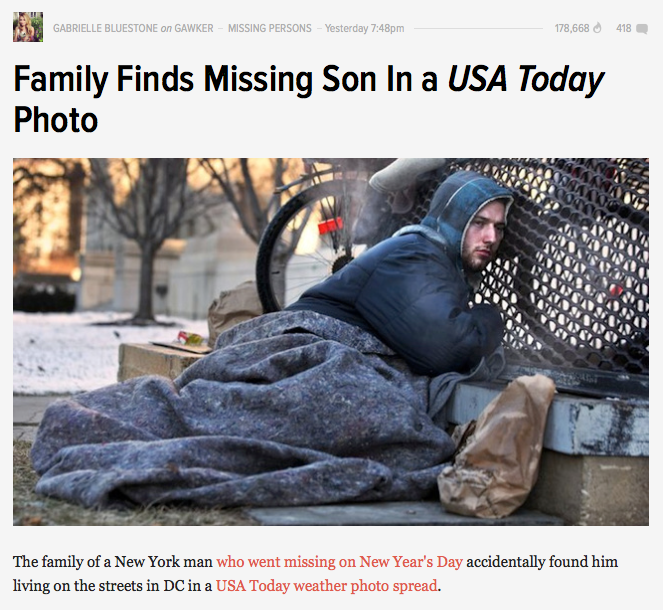 The story was accompanied by a photo taken by Associated Press photographer Jacquelyn Martin of a homeless man, who identified himself only as “Nick,” warming himself by a grate in Washington D.C. The man turned out to be Nicholas Simmons, a 20-year-old who disappeared from his home in upstate New York on Jan. 1. His mother, Michelle Hannah Simmons, reached out to DiBlasio, who contacted the photographer. Together, they helped Nick’s mother track him down. As of this afternoon, stories about DiBlasio appeared in everything from the USA Today-affiliated Rochester (N.Y.) Democrat and Chronicle, where people who knew Nick originally saw his photo, to the Canadian National Post. DiBlasio said she has also been invited to talk about her experience on the Jan. 6 episode of Inside Edition. 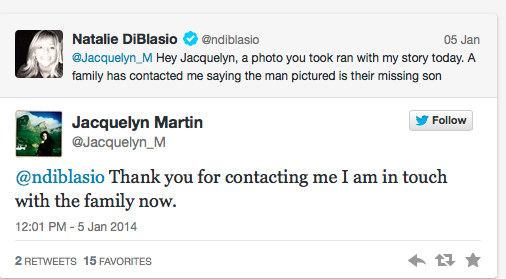 Gawker was among the first to report about DiBlasio’s work in helping a mother find her missing son.